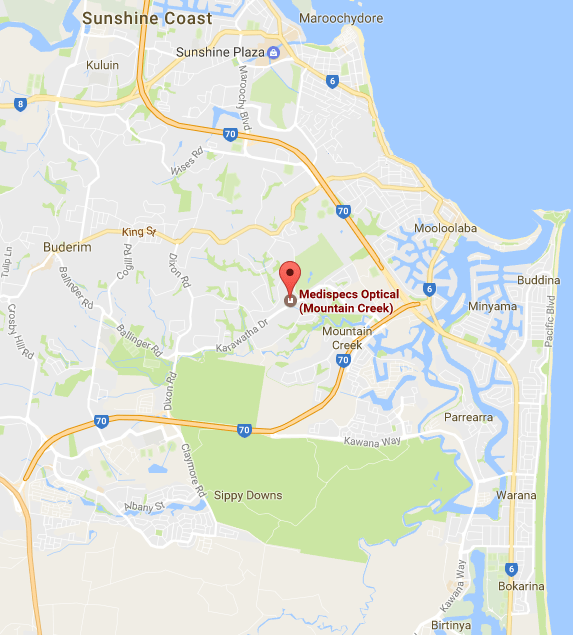 Medispecs Mountain Creek is a locally owned independent optometrist practice on the Sunshine Coast. Our optometrists Douglas Garth and Emma Richards have many years of experience behind them. Combined with the latest digital eye testing equipment, they’ll make sure your vision’s clear and comfortable. Our eyewear is sourced from fashion houses the world over. We have Australian designed brands, as well as the latest offerings from fashion houses like Oroton, Versace and Davidoff. We also have many unique frames – for people wanting something that little bit different, as well as sporty frames from Nike, Oakley and Rayban. Prefer to wear contacts? We are able to fit and supply contact lenses from all the major suppliers like Johnson and Johnson, Coopervision and Alcon, as well as specialist fitting of RGP’s and soft conventional lenses. We also have coloured lenses if you’re up for a change!